In a state ready for strong leadership at the top, Gov. Nathan Deal was the right man at the right time. He’s already looking ahead to a second term. Nathan Deal wants to make Georgia the No. 1 place in the country to do business. He is crystal clear on that. As governor, he can already claim a pair of big successes: Last year Caterpillar, the construction equipment manufacturer, announced it is moving some production from Japan to Georgia; it will bring 1,400 jobs to the Athens area. Baxter International, the pharmaceutical supplier, announced a new manufacturing facility east of Metro Atlanta that will ultimately provide 1,800 jobs. The business and economic development communities give Deal high marks for his openness and willingness to listen to and entertain ideas – whether or not he actually embraces them. The same goes for legislators. With the economy improving – slowly, but improving nonetheless – there is a sense among state leaders that the right man is at the helm, poised to get Georgia moving again. For his dedication to job creation and his willingness to work with business and economic development interests, Gov. 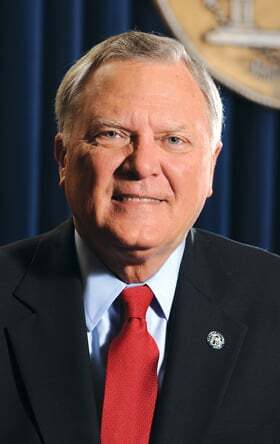 Nathan Deal is Georgia Trend’s 2013 Georgian of the Year. Two years into his term, Deal obviously relishes his job, and he will run for another term in 2014. “I hope the people of the state believe I have merited a second term. I’ve worked very hard and expect to continue to work very hard,” he says. Deal is a Georgia native, a conservative Republican from Gainesville who is part of the North Georgia Republican triumvirate (with Lt. Gov. Casey Cagle from Gainesville and Speaker of the House David Ralston from Blue Ridge) that runs the state. He has a varied background – military officer, lawyer, district attorney, juvenile court judge, businessman, lawmaker. He spent 12 years in the State Senate and 17 years in the U.S. House of Represen-tatives – he started out as a Democrat, then switched parties in 1995. He was elected governor in 2010. Deal’s campaign and first few months in office were dogged by financial difficulties related to a daughter and son-in-law’s failed business. A few weeks before he resigned his House seat to run for Governor, the Office of Congressional Ethics recommended that the House Committee on Standards of Official Conduct do a review to determine whether he had used his office to influence decisions that favorably affected his Georgia business interests. That committee took no action; once Deal left office, it no longer had jurisdiction. The state ethics commission investigated and dismissed four complaints relating to his gubernatorial campaign expenses; the governor agreed to pay $3,350 for “technical defects” relating to other complaints. When Deal took office, the state had been under Republican leadership for several years, but his predecessor, Sonny Perdue, was a status quo governor who saw himself as a manager and caretaker and seemed to be missing the vision gene. Perdue’s most enduring legacy remains his Go Fish Georgia program. Republicans had survived a scandal in the House that unseated former Speaker Glenn Richardson and installed Ralston, as well as some intra-party maneuvers that stripped Cagle of much of his effectiveness in the Senate. The state was ready for some real leadership at the top, and Republicans were in need of someone willing to use the power of that office. Deal obliged. His more open style was immediately apparent and generally welcomed. Deal’s early legislative successes included an overhaul of the HOPE Scholarship Program his first year in office, followed last year by criminal justice reform, a tax reform package and a tough immigration bill – that last one not universally favored by business leaders, particularly agribusiness. Deal says he values his good relationship with legislators. Public safety, Deal says, is the No. 1 responsibility of state government, and the second is public education. Just about everything else is way down the list. Even absent decreased revenues and tighter budgets, Deal is an advocate of smaller government. He pulls out a budget document and points to some figures, proud of the fact that state spending per capita has dropped from $2,035 in 1990 to $1,971 in the current 2013 fiscal year and that the number of state employees dropped from a high in 2008 of 82,080 to 70,324 for the last fiscal year. His decision to turn down $40 billion in federal money to expand Georgia’s Medicaid program, he says, “comes down to being able to afford things,” and he doesn’t believe Georgia can afford a larger program. The governor favors a strong economic development role for the state. “Finding and creating job opportunities is one of the primary goals the state should have,” he says. Deal enjoys the victory and its come-from-behind aspect, but he sees a need to be even more aggressive. “Part of our story is not being told. That’s why our Economic Development Department is so important – they tell our story. They do the outreach to those who are like the Baxters and the Caterpillars who want to come in and create new job opportunities. We think we’re on the right track. “Part of our tax reform package last year was directly aimed at increasing manufacturing in Georgia, phasing out of sales tax on energy used in manufacturing.” The measure had not passed the General Assembly at the time the Caterpillar and Baxter announcements were made, but knowing it was in the works was important to the companies, Deal says. He wants to see changes in public schools, especially high schools – more apprenticeships, the “Move On When Ready” approach instead of “so many hours of seat time.” Many drop out, he believes, simply because they are bored and don’t see the relevance of their high school education. He supported the Charter School Amendment that passed in November and is critical of what he calls a “disastrous” opinion of the Georgia Supreme Court that ruled local boards have exclusive authority over public education. “If the state is going to be expected to come up with money, the state should have some opportunity to come up with options,” Deal says. “We have school boards in the state that are totally dysfunctional. We have some where I’ve had to remove the entire board, in other instances members of local boards of education. “Georgia has great opportunity as one of the few states eligible for Race To The Top money – we are able to be innovative, able to think outside the proverbial box for education. We have about 26 systems that are partners in that process and 15 other schools also participating. It’s encouraging. Great things [will] come out of it. After two busy and productive sessions, Deal says his 2013 legislative agenda is more about implementing some of the measures already passed than initiating any sweeping changes. He mentions revisiting some of the changes made, to see if there are “technical corrections” needed. As an example, he expects the secretary of state to propose legislation to streamline the process of applying for a business license that has frustrated business owners. Despite a favorable 11th Circuit Court of Appeals ruling on Georgia’s right to water from Lake Lanier, Deal says talks with Florida and Alabama are ongoing. Transportation is a big problem getting bigger, especially in light of the T-SPLOST initiative, which Deal endorsed, but which failed in seven of 10 regions in the state. He is looking to the business community for help. Yet he has no intentions of giving away the candy store, he says, referencing the proposed public-private partnership that would have built toll lanes on the I-75/I-575 corridor by leveraging private contributions mix-ed with state and federal money. He scuttled it, believing the state was conceding too much control to private interests. Whatever other issues surface, Deal gives every indication of keeping his Capitol office door open for the next two – or six – years.